The verdicts were announced shortly after 11 a.m. to a courtroom packed with friends and family members of the defendants and with government officials. The process took more than twenty minutes as Judge Robert Kugler read each of the 25 counts in the case and the jury foreman declared "guilty" or "not guilty" to each charge faced by each defendant. Scarfo and Pelullo have been held without bail since their indictments in November 2011. They showed little emotion as the process played out. Scarfo heard the word "guilty" tied to his name 25 times. Pelullo charged with one less count, heard it 24 times. Both men, because of their prior criminal convictions and because of their principal roles in the scam, face from 30 years to life when sentenced by Judge Kugler. Sentencings have been scheduled for October. The verdicts capped a six-month trial and a federal investigation that began more than seven years ago. The probe became public in May 2008 when the FBI conducted a series of coordinated raids in Philadelphia, South Jersey, Miami and Irving, Tx (where FirstPlus was based). Authorities charged that the takeover of FirstPlus began in the spring of 2007 when Scarfo and Pelullo began to maneuver for control of the troubled mortgage company. At one point, FirstPlus had been a key player in the subprime lending business but had subsequently fallen into bankruptcy. Scarfo and Pelullo were accused of using fear and intimidation to insert their own candidates on to the company board of directors in the summer of 2007. Authorities charged they were controlling the company by that point, even though their names never appeared on any company documents or on filings with the SEC and other government agencies. Full of bravado and bluster, according to witness testimony, Pelullo was involved in the day-to-day operations of the company and used his own arrogance and allusions to his organized crime connections to instill fear in those who balked at doing his bidding. Several hours after the verdicts were announced, Scarfo's court-appointed attorney, Michael Riley, said he was disappointed but not surprised. Riley said he would "aggressively" pursue every appeal issue. As he had throughout the trial, Riley said the government mischaracterized the case in order to convince the jury. "This was prepared and packaged as a mob case in order to make a weak white collar case more saleable to the jury," Riley said. He said his client was also disappointed but not surprised by the outcome. 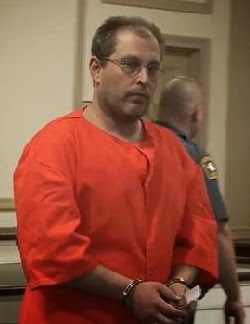 The younger Scarfo, Riley said, has continuously paid a judicial price for the criminal acts and reputation of his more notorious father. Little Nicky Scarfo and jailed Luchese mob boss Vittorio "Vic" Amuso were named unindicted co-conspirators in the case. The government alleged that both were to benefit from the fraud. In a separate hearing this afternoon, the jury also granted all the government's forfeiture requests for assets the defendants had obtained through the fraud. These included a yacht and an airplane purchased by Scarfo and Pelullo, a Bentley purchased by Pelullo and bank accounts and other valuables, including jewelry Scarfo purchased for his wife. The readings of the verdicts came in a tense courtroom where friends and relatives had begun gathering earlier in the morning. The jury panel had sent a note to Judge Kugler late yesterday afternoon announcing that it was close to a consensus but wanted to sleep on its findings before announcing them. The first verdicts announced for the racketeering conspiracy count that topped the indictment set the stage for what was to follow. Scarfo, Pelullo and the Maxwell brothers were found guilty, but Adler, McCarthy and Manno were found not guilty. What followed was the recitation of the remaining counts and as the jury foreman declared "not guilty" again and again on separate fraud charges, friends and family members of Adler, McCarthy and Manno began to smile and quietly nod to one another. One friend of McCarthy's offered a quiet fist pump as he sat in the third row of the packed courtroom and heard "not guilty" announced to a securities fraud charge, 17 wire fraud charges and one money-laundering charge that McCarthy faced. "A six-year ordeal is finally over," Manno, a veteran criminal defense attorney who had represented Scarfo for years, said as he exited the courtroom. "They split the case the way we had argued for in a severance motion," Manno said of the jury's verdict, referring to a motion rejected by Judge Kugler to have Scarfo, Pelullo and the Maxwell brothers tried together and Ader, McCarthy and Manno tried in a second trial. Gross, himself a former federal prosecutor in Philadelphia, thanked the jury and the judge and said his client "looks forward" to returning to his legal practice. Adler, based in New York, specializes in SEC filings.While a federal prosecutor for the U. S. Attorney's Office for the Eastern District of Pennsylvania, Gross had won convictions of some of the top mobsters in Philadelphia, including Scarfo's father, "Little Nicky" Scarfo. In a prepared release later in the day Gross, who works for the Philadelphia law firm of Drinker, Biddle&Reath, said, "There was an enormous quantity of information that the government presented in this case, but the jurors clearly took their responsibilities very seriously and justice was finally achieved." In a prepared statement released by his office, Paul Fishman, the U.S. Attorney for New Jersey, said those convicted had "given new meaning to the term 'corporate takeover' looting a publicly traded company to benefit their criminal enterprise." He said the case proved the "rampant self-dealing, fraudulent SEC filings and intimidation" that had been used to advance the fraud. Assistant U.S. Attorney Steven D'Aguanno, based in Camden, and FBI Agent Joseph Gilson spearheaded the probe which also included the SEC, the Department of Labor and the Bureau of Alcohol, Tobacco, Firearms and Explosives. Neither Maxwell brother offered any comment. Both appeared resigned as the guilty verdicts, one after another, mounted against them. William Maxwell continued to jot notes on a legal pad. John Maxwell sat with his head resting on his hand. Following the hearing on forfeiture actions, Judge Kugler revoked the bail of both Maxwell brothers and ordered then imprisoned pending sentencing. William Maxwell was accused to helping to funnel cash to Pelullo and Scarfo through a series of phony consulting contracts. Maxwell was appointed as legal counsel for the firm at a fee of $100,000-a-month plus expenses. A firm set up by Pelullo was given a similar contract and in turn transferred $33,000-a-month to a Scarfo front company. Those cash transfers were the bulk of the wire fraud charges in the case. Deliberations over the last three days appeared to be headed toward the conclusions that were announced today, Questions from the jury panel indicated early in the week that it had voted to convict some defendants on the overarching racketeering conspiracy charge. Scarfo, Pelullo and the Maxwell brothers were the four defendants directly involved in the company, according to evidence and testimony and were the logical targets of that finding. Adler, McCarthy and Manno were not directly involved in any business decisions. The jury also voted to convict on two weapons counts. Scarfo, Pelullo and the Maxwell brothers were guilty of conspiracy to sell and possess firearms, a count tied to a cache of weapons and ammunition found on the yacht. Scarfo was convicted of a second weapons offense based on two guns found in his Egg Harbor Township home during one of the raids in May 2008. As convicted felons, neither Scarfo nor Pelullo are permitted to possess guns. Scarfo has two prior convictions on organized crime-related racketeering and gambling charges. He also was the target of a failed mob assassination on Oct. 31, 1989, in a South Philadelphia restaurant. The shooting, one of the most notorious in the history of the Philadelphia mob, effectively ended any attempt by him or his jailed father to control the local crime family. Before the verdicts were announced, John Maxwell, who despite his complaints about media coverage had consistently and graciously made himself available to the media, said "It is what it is...As a kid I used to do some bull riding. This can't be any harder than that." John Maxwell had insisted that he was only following the advice of lawyers while running FirstPlus and that he was targeted because he had declined to cooperate in an investigation of Pelullo and Scarfo. He often joked that as a Texan he knew little about organized crime or the Luchese crime family to which Scarfo belonged. The only Luccheses he knew, Maxwell quipped, were the Texas boot making company that has been in business since 1883. The forfeiture hearing that took up this afternoon's court session focused in large part of who would be held accountable for the money that was siphoned out of FirstPlus. Throughout the trial, the government argued that the money was used primarily by Scarfo and Pelullo to support a lavish lifestyle that included the yacht, the Bentley and a $715,000 home near Atlantic City that Scarfo and his wife purchased early in 2008. Lawyers for Pelullo, Scarfo and the Maxwells argued that FirstPlus failed because of a poor economy and the negative impact of the federal investigation which became public after the raids in May 2008. The defense also argued that the government used the specter of organized crime to sensationalize the charges but insisted there was no mob involvement. Twelve defendants were originally named in a 25-count indictment handed down in November 2011. Five defendants, including Scarfo's wife, have pleaded guilty. She is awaiting sentencing on bank fraud charges linked to a mortgage for the home near Atlantic City. YOU CANT KEEP SPITING IN THE GOVERMENTS FACE AND WALK AWAY.THEY GOT TO MUCH MONEY AND TIME. Justice, finally. It's about time. Thank you George Anastasia for your excellent report. I guesa Manno will be up to snuff in his new dealings shortly. Too bad you didn't report how the FBI said it didn't investigate because it already decided the end result or how other witnesses said on the stand that they lied to the grand jury the FBI, and to the trial jury. How much did the government spend on this? Big House in TEXAS forsome SOURHERN HOSPITALITY! At least Scarfo Jr hasn't flipped like most of these Mafioso nowadays. But I do agree with the attorneys. If his name wasn't Scarfo this would be a white collar case with little jail time faced but they used it to bring in RICO and sell papers on how the feds are doing there job. I just saw a similar case (without mafia included) amd the men each received less than five. You tell me George A , do you agree with this assumption of mine.? Ya and if he didnt get convicted of other felonys he might have gotten the same treatment as those other people ur talking about but he just cant get it right he cant be rehabilitated there fore he.s a threat to the public and like baseball three strikes ur out BILL CLINTON SAID. Ur right to some point but remeber those other people it is probably there first felony these two guys are career criminals 3 time losers guidelines are higher also they new deal when they chose to be MOBSTERS! !!! So d'aguanno is concerned about the shareholders...they didn't lose any money until the government took over the company. Government seized the airplane and let it sit for 6 years with no maintenance, so it won't be worth anything. Govt sank the yacht so it's not worth much. Govt put a felon in charge of the company after it took it over--just a few days before going public on NYSE and forced it in to bankruptcy. I'd say the govy owes the shareholders.